The service we received from Ian was excellent. He couldn't have done more to ensure our holiday was perfect. I would highly recommend booking your holiday with Ian through Koh Phangan Holiday Homes. Ziva Villa was extremely luxurious, it truly was our holiday in paradise. We are looking forward to going back to Ziva Villa in the next few years. Ziva villa was awesome great spot in the jungle. Huge pool wicked space, the owner picked us up and dropped us off top lad. This pad certainly turns heads. Would recommend to anyone looking to chill and party in koh phangan. Rooms are massive with 4K tv and Netflix in each room. Fresh towels every day. 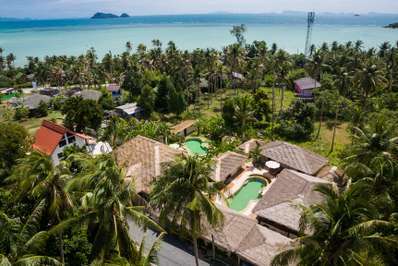 Ziva Villa is set in the quiet coconut groves of Koh Phangan a short distance from Srithanu village and the beaches of Haad Chao Pao and Haad Yao. If your looking for a little more excitement the nightlife areas of Ban Tai are 10 minutes away and the Full Moon Party of Haad Rin is a 20 minute drive. 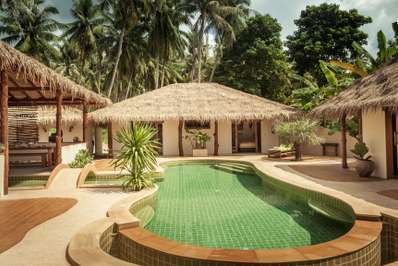 Ziva Villa is a recently constructed stunning contemporary property located within the coconut groves of Srithanu an area a short distance away from the west coast of Koh Phangan within easy reach of many of the islands pristine white sandy beaches. The villa is laid out in a courtyard or "U shaped” configuration with the main unit at the head if the U. The main unit comprises of a large open plan kitchen and living area with modern kitchen and large breakfast bar. If you are a keen chef the kitchen is fully equipped enabling you to rustle up your favourite meal, alternatively we are also able to deliver fresh Thai cuisine direct to the villa. The lounge area has an oversize sofa from where to enjoy the TV and audio system. There are floor fans to keep the room nice and cool. The three units are adjoined buy a large thatch covered terrace that offers shade from the heat of the day, hammocks offer a place to relax and enjoy the landscaped gardens. To the end of the garden is a large deck area with Japanese style mats to lounge in the sun. The swimming pool is 10m x 4m and has a jacuzzi to one end. The surrounding area is made up of quite coconut groves a perfect place to get away from it all.